Go To PaisaGet Website from HERE. Now Just Signup Via Facebook or By Mail. 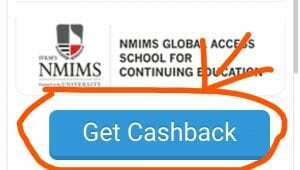 Now Scroll Down & their you can see an Offer like Below Pic..
Now Click on Get Cashback. 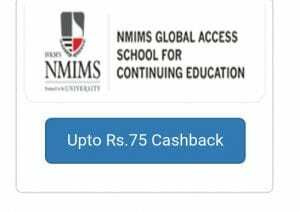 You will be redirected to NMIMS Official Website. Their Just Fill the Form as below..Enter Name, Email, & Other Details and then verify no. with OTP. CC Question – Which Course do you Want To do ? CC QUESTION – In which subject? 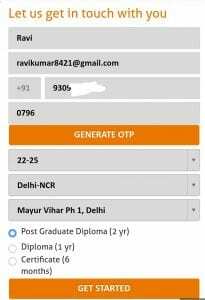 CC Question – Percentage in Graduate ? Your answer – Speak anything like 81% or 85 %….. Above is just an extract of my talking with them… They can also ask extra questions with you.,.. If you get confused just said them… Can you call me later i have to confirm with my friend or batchmate..